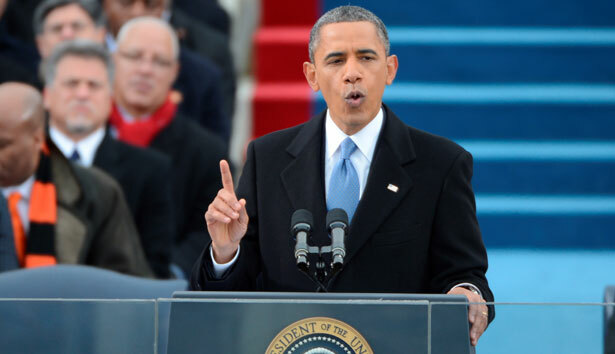 Obama’s second inaugural address laid out a new progressive vision. Now we must make it real. Barack Obama, the president who publicly swore his second oath of office on the Bibles of Abraham Lincoln and the Rev. Martin Luther King, Jr., used his inaugural address to chart an arc of history from the liberation movements of the sixteenth president’s time through the civil rights movements of a century later to the day on which hundreds of thousands of Americans packed the National Mall to cheer for the promise of an emboldened presidency. Not out of mere charity, but because peace in our time requires the constant advance of those principles that our common creed describes; tolerance and opportunity, human dignity and justice. We the people declare today that the most evident of truth that all of us are created equal—is the star that guides us still; just as it guided our forebears through Seneca Falls and Selma and Stonewall; just as it guided all those men and women, sung and unsung, who left footprints along this great mall, to hear a preacher say that we cannot walk alone; to hear a King proclaim that our individual freedom is inextricably bound to the freedom of every soul on Earth. With his mentioning of the Stonewall protests, where the gay rights movement took form, Obama went further than any president in the country’s history to complete a circle of inclusion. But Obama, often and appropriately criticized for his caution, did not end on that high note. He went further still. And there was more, much more. There was the vital recognition that poverty is a form of oppression—not a moral failing. “We are true to our creed when a little girl born into the bleakest poverty knows that she has the same chance to succeed as anybody else because she is an American, she is free, and she is equal not just in the eyes of God but also in our own,” said Obama. A beautiful statement, yes. Significantly, in a time of debate about the future of governing commitment to those whose dreams have been so long deferred, Obama completed the arc from FDR and LBJ to today, not just mentioning but defending Social Security, Medicare and Medicaid. That last line recalled the “makers versus takers” language of Congressional Budget Committee chairman Paul Ryan, the Wisconsin Republican who as his party’s presidential nominee suggested that the 2012 election was in many senses a battle between an imagined majority and a dismissed 47 percent. Will Obama disappoint in this second term? Yes. Will he need to be poked and prodded, chastised and challenged by Americans who demand that the progressive language of his inaugural address be—in Obama’s words—“made real”? Absolutely. More so now than ever. But with this inaugural address President Obama has offered an indication that he heard the American people on November 6. They were not re-electing him merely because they liked him as a man. They were re-electing him to dispense with the fantasy—entertained not just by Republicans but by too many Democrats—that “freedom is reserved for the lucky or happiness for the few.” And to complete the journey from Seneca Falls to Selma to Stonewall and to the place of economic justice where every citizen has that basic measure of security and dignity that can and must be America’s promise. For more commentary on the presidential inauguration, read Michelle Dean's take on the politics of Michelle Obama's fashion.